If you've got cucumbers + Greek-style yogurt + scallions + lemon zest and juice, you've got all the makings for a refreshing summer recipe: Frances Largeman-Roth's chilled cucumber soup. If you’re like me, you buy too many cucumbers at the farmers market (or have grown too many in your garden) and need to do something with them. 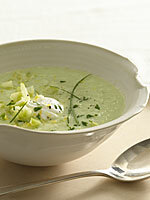 This refreshing, quick soup recipe is a great way to use up those cukes. Peel, seed, and chop about 4 large cucumbers. Place ¾ of the cucumbers in a blender or food processor. Add ½ cup plain fat-free Greek-style yogurt, ¼ cup chopped scallions, ½ teaspoon lemon zest, plus 2 tablespoons fresh lemon juice. Process until smooth. Add ½ teaspoon salt and ¼ teaspoon pepper, or to taste. Chill for an hour. Garnish with chives and a dollop of crème fraîche, if you have them on hand.